Thursday, July 23rd - The tour begins! We were just ecstatic that we woke to sunny weather and clear skies. 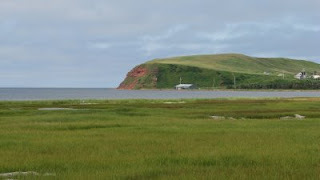 The Îles de la Madeleine or in English, the Magdalen Islands is a series of almost a dozen islands in the Atlantic Ocean, six of which are linked together by narrow sand dunes and causeways. They fall under the governance of the Province of Quebec. 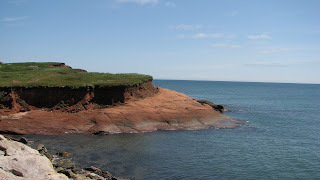 The archipelago of the Îles de la Madeleine is located about 105KM from Prince Edward Island and is only accessible by boat and air plane. The majority of the population are Francophone/Acadian in culture. There is however, a small Anglophone population also located in the region. It is beneficial if you know a little French, we were fortunate as Luc speaks English and French and he was our communication guy! Our plan for the first day was to check out the six interconnected islands. 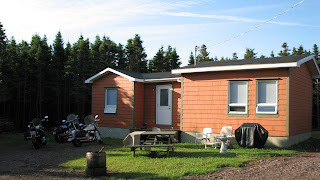 Our rented cottage was located in the community of Fatima on Cap aux Meules Island. The cottage was nestled back in some trees and was only a stone's throw away from the Gulf of St. Lawrence. We saddled up and left Fatima and headed to Havre aux Maisons Island. 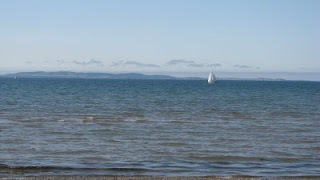 I was not prepared for what we were about the see! The countryside was absolutely breathtaking! 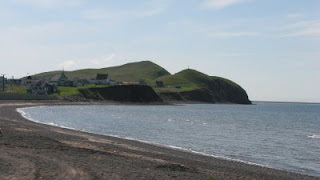 Large grassy fields surrounded by hills, sand dunes, cliffs and beaches. 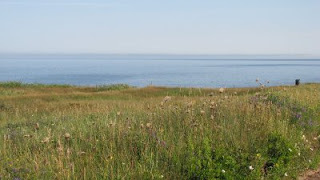 The next stop was Pointe aux Loups Island, the smallest of the six. This small narrow island consists mainly of sand dunes, much like an oasis. You look to the left, you see the Atlantic Ocean, you look to the right, you see the Atlantic Ocean...beautiful sand beaches! From there it was on to Grosse Île and Grand Entrée Islands. 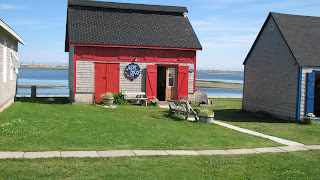 We choose to go to Grand Entrée Island first and to stop at Grosse Île Island on the way back through. Again, we were not disappointed by the scenery! We traveled to the end of Grand Entrée Island where there is a large wharf, several restaurants and shops. Fishing along with tourism are the largest industries on the islands. We parked our bikes and toured the wharf. 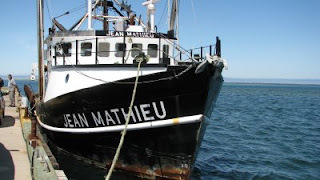 While touring the wharf, Luc, Martin and I came across a large fishing boat called the Jean Mathieu! Several of the fisherman from the Jean Mathieu were working on a net, when Luc asked them what type of fish they generally catch. Well, from there a great conversation took place and we spent about an hour talking to one of the fisherman and the Captain of the boat. 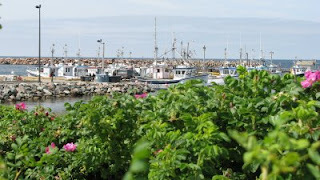 They offered us a beer and proceeded to tell us about fishing for crab, lobster, mackerel and the seal hunt. I think they enjoyed the conversation as much as we did, you see we are all educators, so we had lots of questions and we don't know much about the commercial fishery. 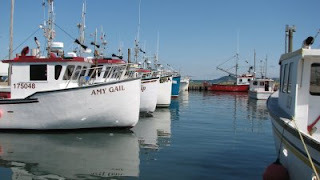 The Captain of the boat, Denis, explained that most of the fishery was not operational at this time of year and if you saw boats going out they were either out for pleasure or possibly looking for some bar clams. That morning, Kendall, one the Jean Mathieu's crew was out and retrieved some bar clams. 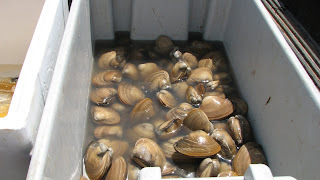 Captain Denis said that the bar clams were excellent, either raw or cooked. He found a knife, opened the clam shell and said, here try this! So I did, the clam meat was quite tender, almost like a scallop. 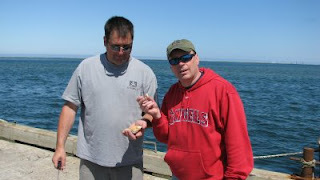 Luc tried as well, but Martin wanted nothing to so with eating raw clams! We continued to talk about fishing and we started to ask questions about the fishing boat. Captain Denis asked us if we wanted to come aboard. We were like 3 little kids, excited and could not wait to see the boat. Captain Denis, showed us the kitchen, the wheel house and the holding area...it was very cool! Sue was watching us from far away and could tell that we were having a great time talking to these guys! 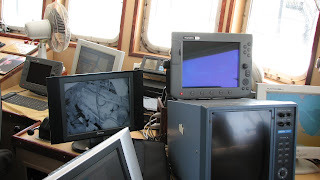 The three of us were very interested in the electronics on board and Captain Denis proceeded to explain how the electronics were used for navigation, etc. One statement was quite profound, he stated that when he first started fishing all he had was a compass to go by, now he is completely reliant on electronics and technology. We thanked Captain Denis and his crew for the tour and proceeded to find Susan and some lunch! Susan could not stop laughing at how excited we were by the tour of the boat! And a second stop to view the beautiful white beach at "Old Harry"! After a short stop at Old Harry Beach, we moved on to Grosse Île Island. 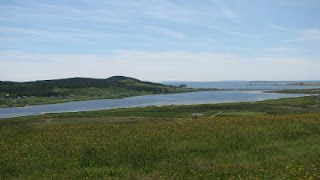 Grosse Île Island is made up of Anglophones who are mainly of Scottish descent. 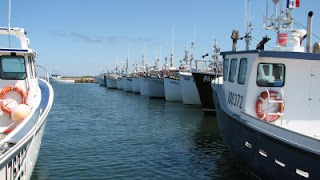 Most work in the fishing industry, there is also a large salt mine located at the entry to the island. 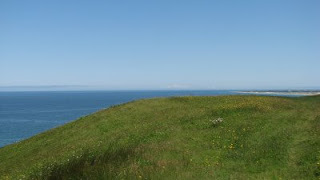 The hills on Grosse Île Island were amazing to look at, we stopped at Grosse Île North and climbed one of the large hills so that we could get a wide angle view of the sand dunes and beach. Here is what we saw from the top of the hill, absolutely stunning! Here is another view in the opposite direction, you can see the salt mine off in the distance. And a view looking out at the Atlantic...I could have stayed on the top of that hill all day! At this point, we had been on five of the six main islands and decided that we would make the trek to the sixth main island, Havre Aubert Island. 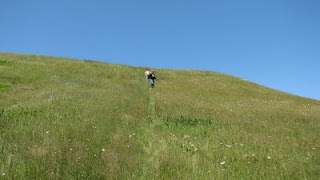 It was about a 60km journey back through some of the area we had already covered. 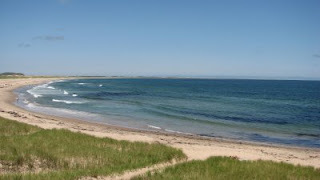 We stopped for a short rest on the beach at Pointe aux Loups Island and then on back to Cap aux Meules Island for fuel. 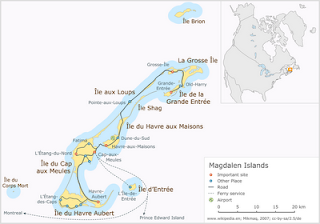 From what we could tell, Cap aux Meules Island is the main commercial centre for the archipelago of islands. 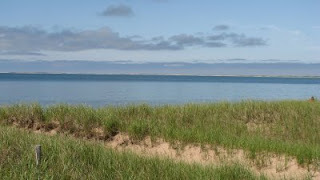 The cruise across the dunes to Havre Aubert Island was just a beautiful as our morning cruise. We stopped at La Grave and toured the area, there are several small shops, restaurants and pubs located there. 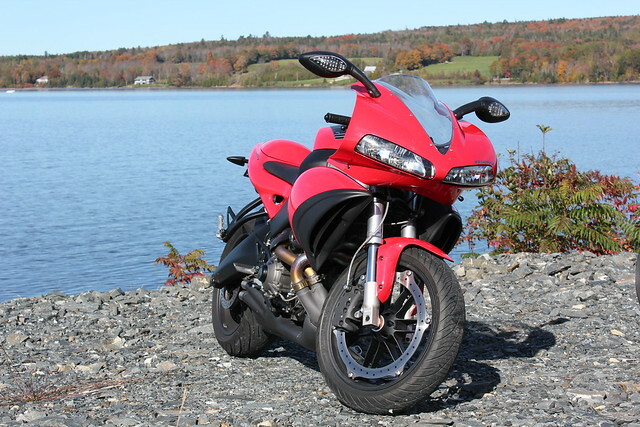 We stopped at a local pub, sat on the back deck and simply enjoyed the view! We also met up with Luc's friend Sarah at this time! We went to another pub for supper where I had a chance, with Luc's guidance to practice my French! Lets just say that I did okay! We were pretty tired after a full day of sun, riding and touring, so we decided to call it a day and go back the cottage! Sue opted to travel by car with Sarah. Martin, Luc and I proceeded to make the cruise back to Fatima. We relaxed during the evening, had a few beers and talked about what a great day we had! Beautiful shots. Looks like one hell of a trip. My family did some traveling in this area whan I was a child—I'd love to go back and enjoy it now. Keep posting! alright, that's more like it! What a beautiful view! Sitting out by the ocean is mesmerizing & relaxing....don't blame you for not wanting to leave. Diggin the info of the Captain & his boat! Day 5 - July 25th The "Voyage" Home!